It’s very tempting to create “cool” design solutions in our home that make it easier to hide unsightly items or because they use “wasted space”. One good example of this is a trend to place dog bowls in drawers under kitchen cabinets or in walls. The idea seems brilliant at first glance – when the dog is through eating the drawer can be closed and the bowls are out of the way. But, is this really a sound solution for your dog? In most cases, dogs should have 24-hour access to water. If the water dish is in the drawer then the drawer must remain open all of the time. This defeats the purpose of the drawer. Dogs also deserve the same courtesy as humans. They need a quiet, undisturbed place to peacefully eat their food. Any place where your dog might have to move out of the way while eating, such as a hallway or kitchen aisle is an inappropriate place to feed your dog. Dishes shouldn’t be placed in front of cabinets, appliances or doors either. A better solution would be anywhere out of a general circulation path, another room, his crate or even at the end of a work island as shown in the image below. The drawer concept also poses a trip hazard for humans. All it would take is walking into that drawer once and it would probably never be used again! This kitchen was designed by Amy Britton, CKD, owner of Artisan Kitchens, LLC of Osterville, MA on Cape Cod. What I really like about the design is that the dishes are at the end of the island, in an out of the way spot. Lighting integrated into the recess makes it easy to see the dishes so the owner can tell right away if the water dish needs to be filled or cleaned. The drawers above with the “dog bone” cutout drawer pulls would be great storage for dog items such as pills, measuring cups, can covers, grooming supplies and more. This is an excellent example of a well-designed dog friendly space. It is important when designing spaces that we share with our canine companions to be considerate of their needs as well as our own. 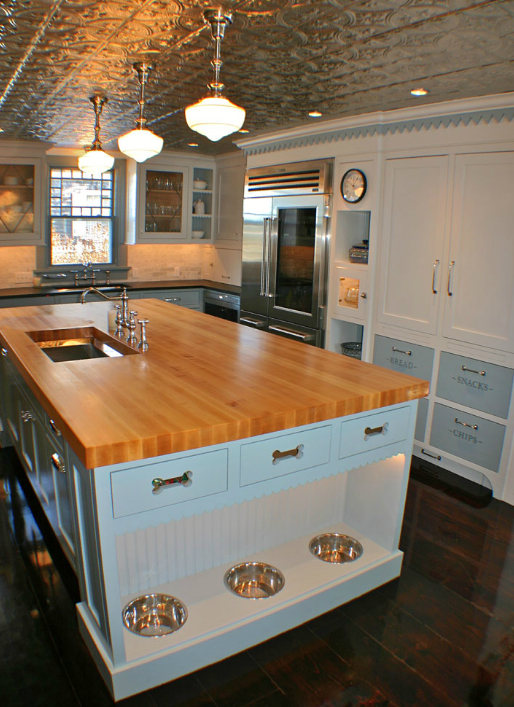 This entry was posted in Design Ideas and Projects and tagged Dog, dog bowls, dog-friendly kitchen, feeding dogs, Kitchen. Bookmark the permalink.